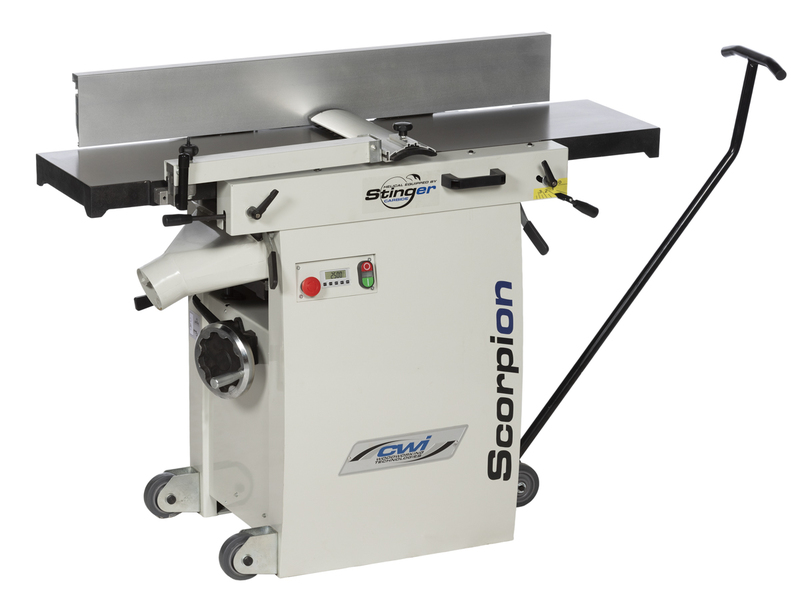 The Scorpion CWI-JP1203HC 12” helical jointer/planer combination machine is literally two machines in one. 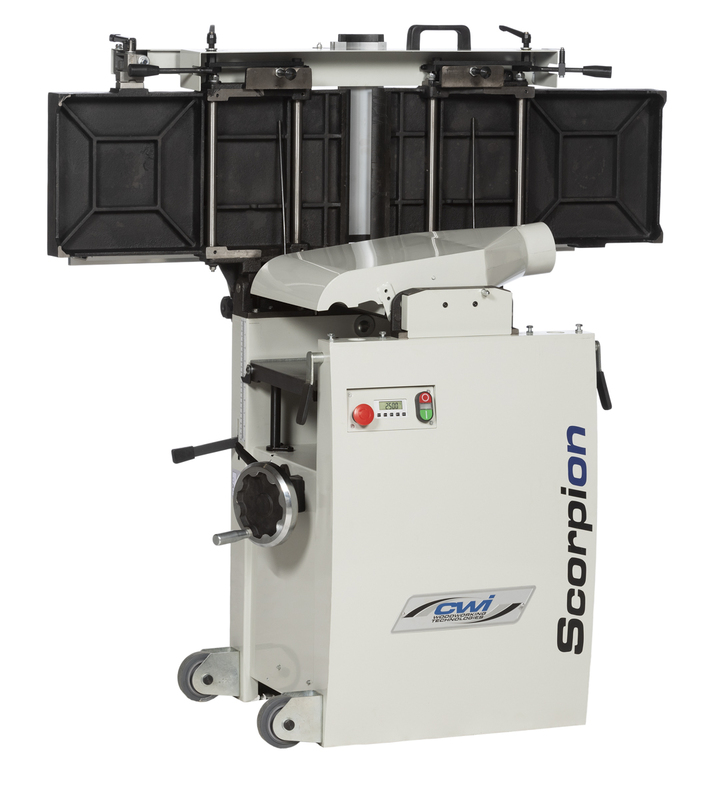 This is a European design of machinery built for challenged shop space size and convenience of operation. Having both a 12” wide jointer and a 12” thickness planer in the same foot print really has its advantages. In North America it is very common to see 6” and 8” jointers in many workshops but in Europe they are virtually nonexistent. In Europe it is far more common to see 12” and larger combination machines for the jointing and thickessing operations in their shops. The primary advantage of two machines in one is space but also it is nice to have that ability to “joint” the face of the wood prior to thicknessing. Having a 12” or larger jointer surface is an advantage over only being able to edge joint on a small 6” or 8” jointer surface. The JP1203HC has a 3 HP 220/1/60 motor which drives a 2 7/8”” diameter Stinger Carbide helical cutter head to machine lumber at up to 1/8” at each pass. 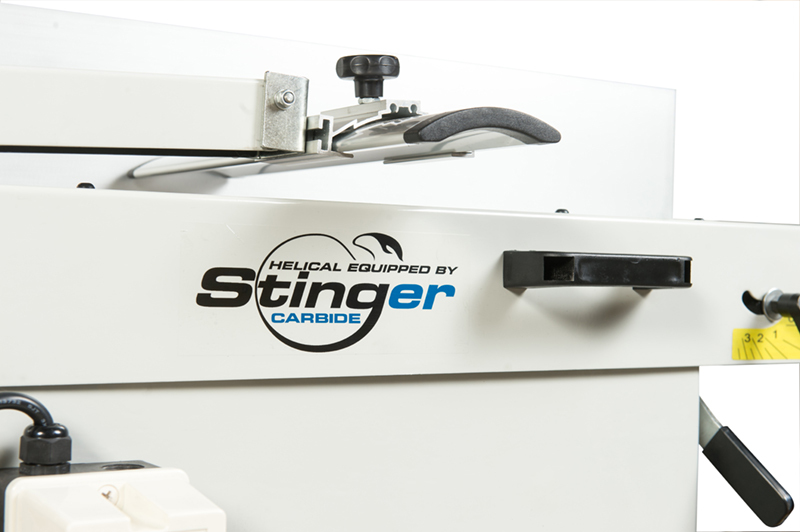 The Stinger carbide helical cutter head has 5 rows of 15mm x 15mm x 2.5mm square four sided convex edge carbide knives for a total of 60 knives. When an edge of a knife gets dull or damaged simply remove the locking screw and rotate the knife to a new edge. We find under normal wear and tear customers will get one to two years of performance from each edge of knife. The 5 rows of knives provide more knife cuts per inch, better overlap of the knives for less knife marks in the wood and virtually zero tear out even on the most difficult to thickness woods. 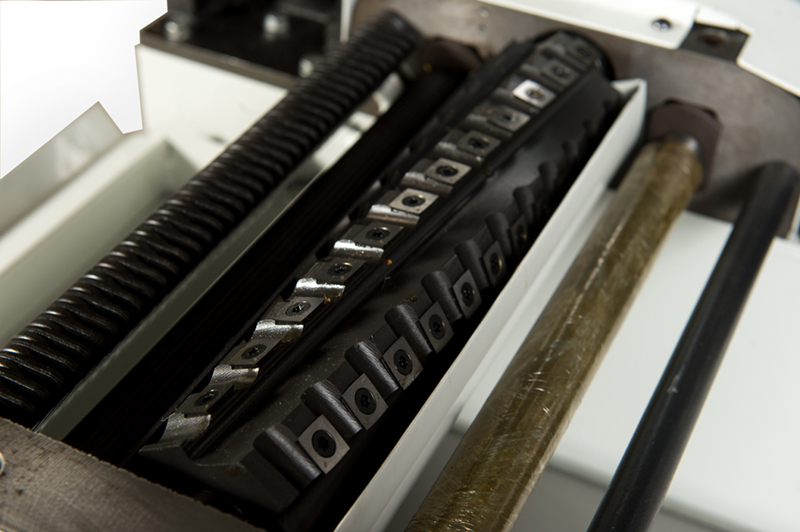 Our Stinger Carbide helical cutter heads are renowned for ease of maintenance, quality of cut, and sound levels so pleasant you almost forget the machine is running. The CWI-JP1203HC features and impressive 12” x 52 ¾” long heavily ribbed cast iron jointer table for excellent support with longer boards. 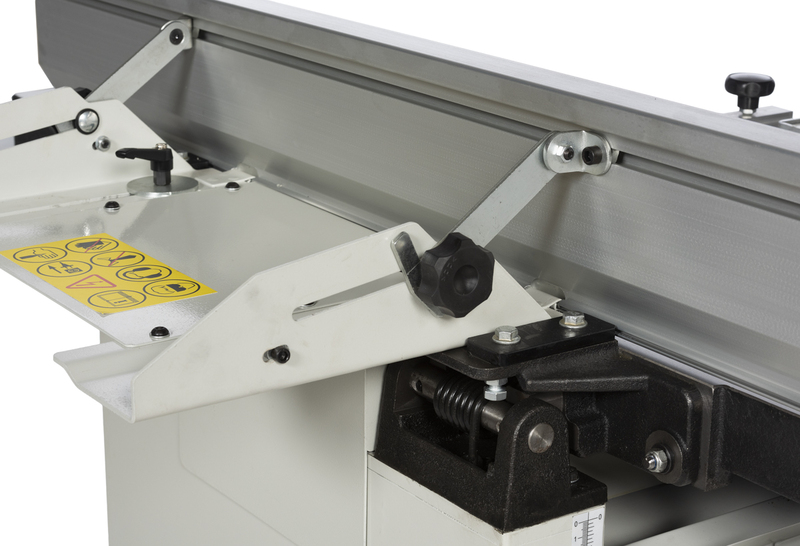 Both the parallelogram infeed and outfeed jointer tables are independently adjustable for height using easy access levers on the front of the machine. 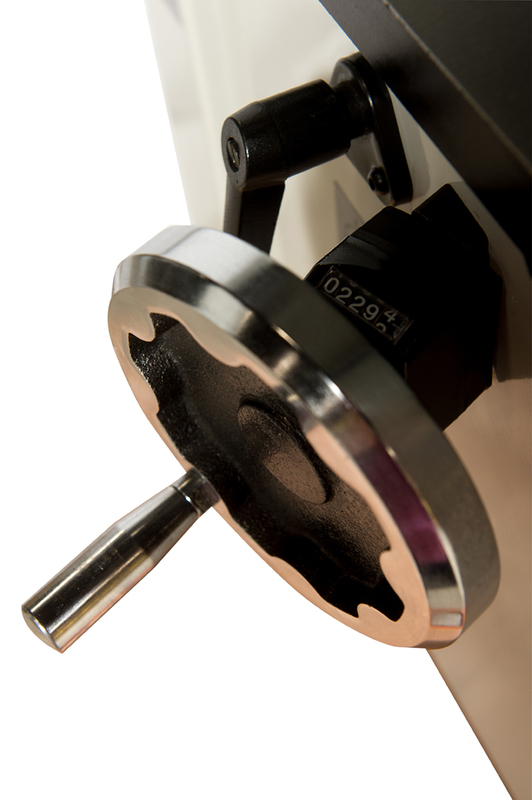 There are two lever table locks to ensure the tables do not move once set to position. 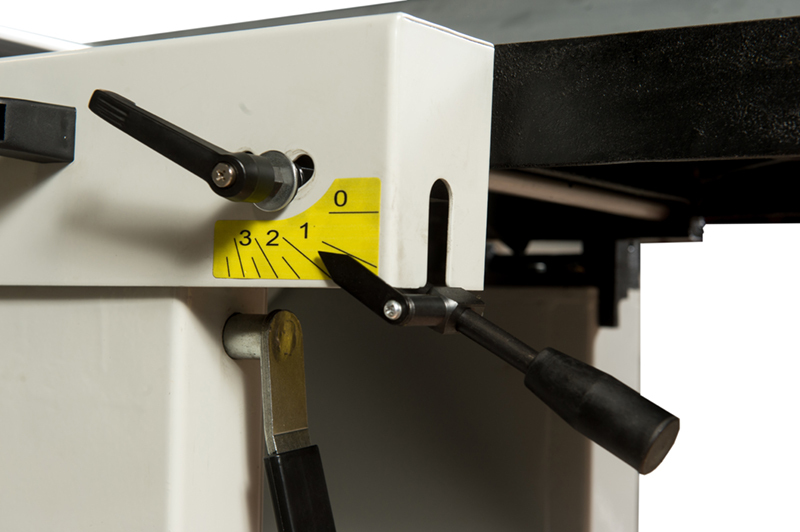 The front table adjusts for thickness of cut and the back table adjusts for accuracy to the cutter head height. The cast iron thickness planer table is 12” x 24” with a support roller for added workpiece support. The planer table is adjusted for height from 1/8” to an amazing 8 ¾” thickness capacity by use of a large hand wheel and a digital readout for accurate settings. The changeover from Jointer to planer is really very simple and takes no time at all. Simply release the table security locks at each side of the cabinet under the table and raise the jointer surface in one move as both infeed and outfeed tables lift together. Then simply flip the dust collection hood over from jointer mode to thickness planer mode and you are ready to go. The other nice feature is because both tables lift at the same time the fence assembly does not have to be moved or removed. It simply remains in place. The heavy profile aluminum fence is 6” tall and an amazing 43” long for excellent work piece support as it travels the length of the jointer bed. The fence securely locks in any position for angle work as well. 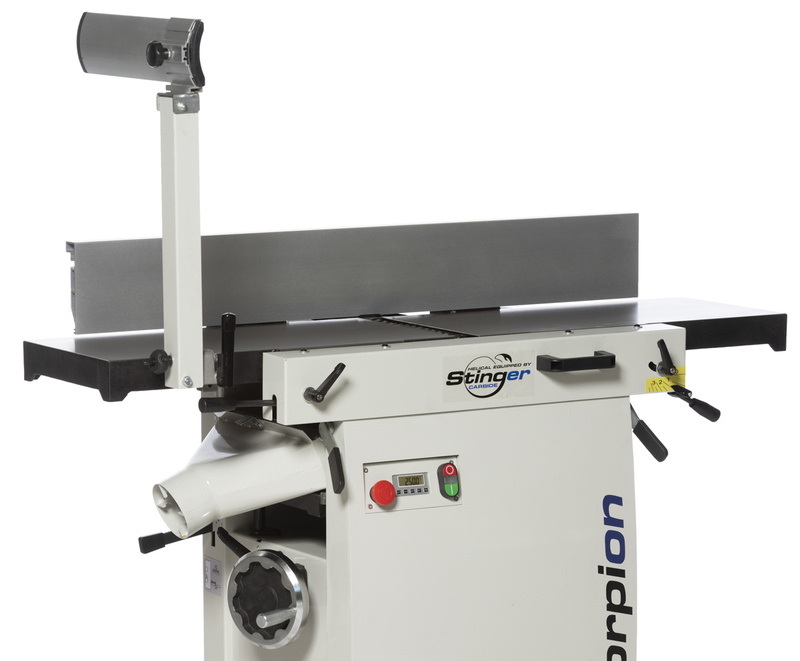 For 2019 the Scorpion jointer/planers in both 12” and 16” have been outfitted with a number of new user friendly features truly making these extraordinary machines even better. First we have gone away from the traditional box type magnetic switch that sticks out of the front of many woodworking machines and gone to a new Euro machine body style with a flush mount electrical panel. 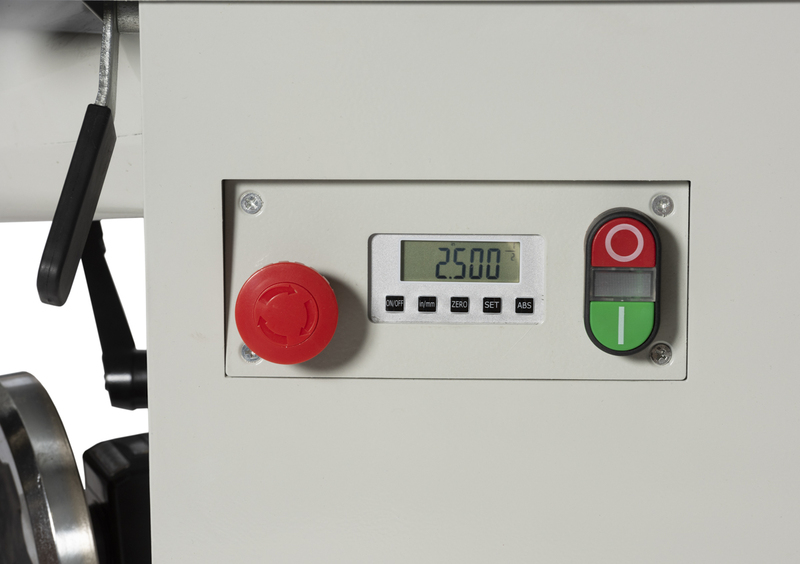 This panel includes an on/off magnetic switch with overload and under voltage protection as well as a separate emergency mushroom stop button. 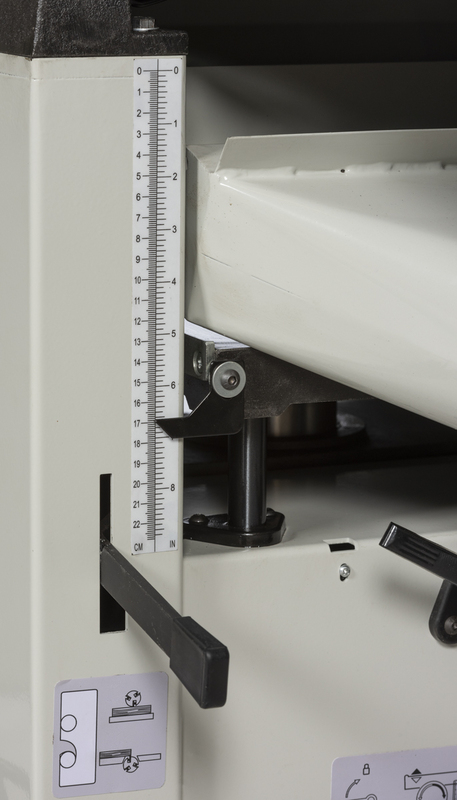 Also on the panel is a new electronic digital height read out for the thickness planer tables. 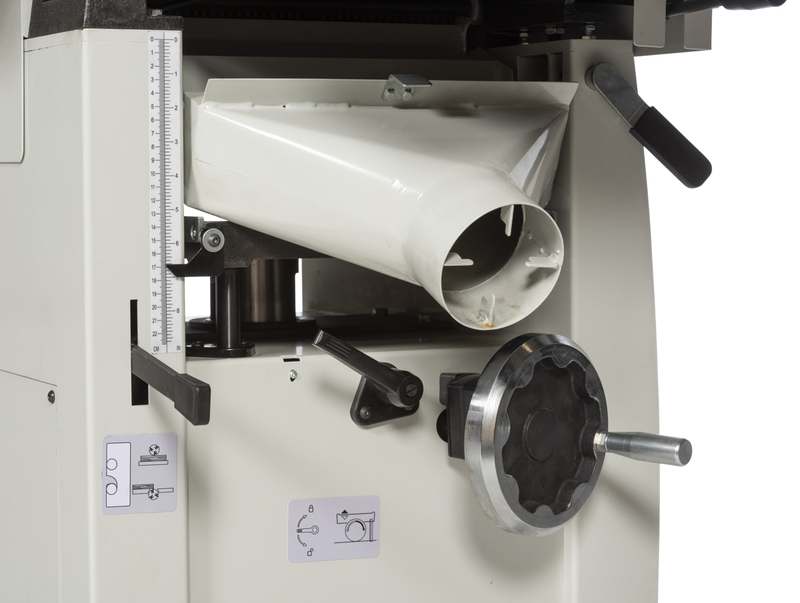 This makes it much easier to calibrate the machines height without bending around under the machine. Also the flush mount panel stops those uncomfortable knee bangs that used to happen when walking past the old magnetic box switch. Another new feature is the Euro style guard now has a lever to unlock so users can easily swing the guard out of the way when performing certain cuts or maintenance on the cutterhead. The last really important feature we have been asked for is a mobility kit. 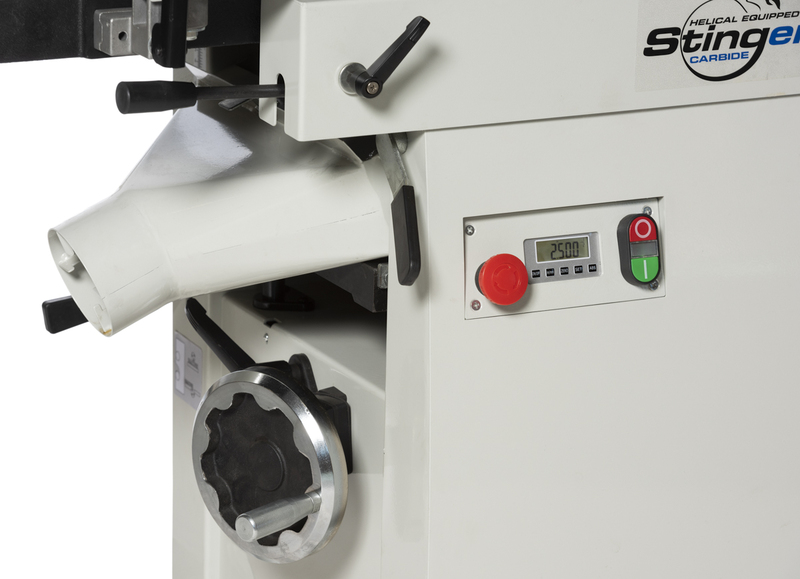 Both models now come standard with 4” diameter rubber wheels attached to one side of the machine and a separate large wheeled handle that slips under the other side of the machine to allow the user to lift and steer the machine around his shop when space is needed. The machine sits normally on its frame for secure rigid footing and only engages the wheels when the handle is used. 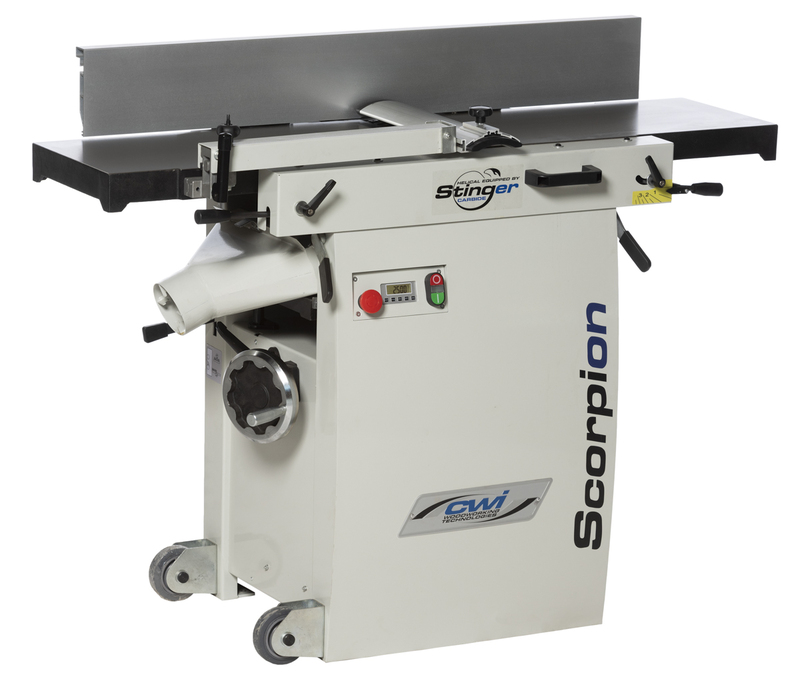 The Scorpion CWI-JP1203HC is an excellent machine not only for limited space requirements and huge capacities but is just a fantastic made machine with an amazing Stinger carbide helical cutter head for performance any woodworker will cherish!